This must be what Honda Heaven looks like! 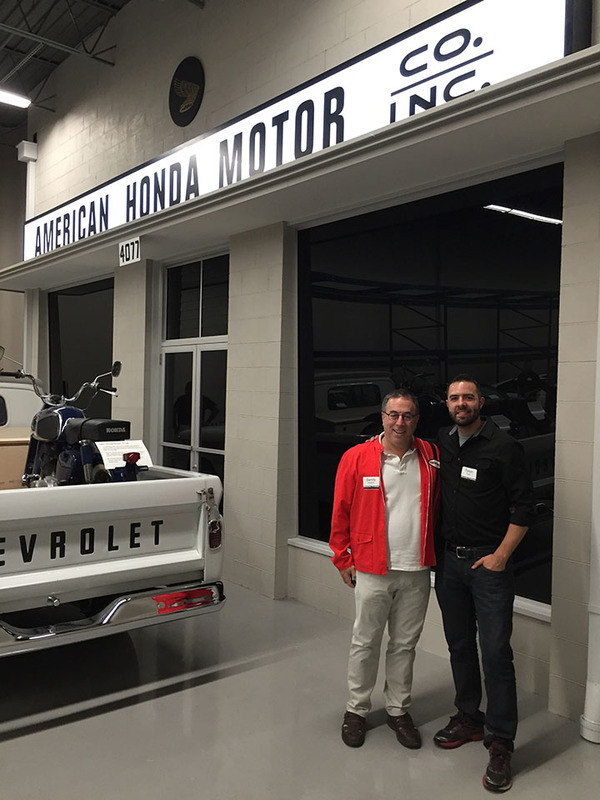 Acura race team driver Peter Cunningham knows a thing or two about vintage Hondas. After all, he’s driven them competitively since 1987 – nearly 30 years! 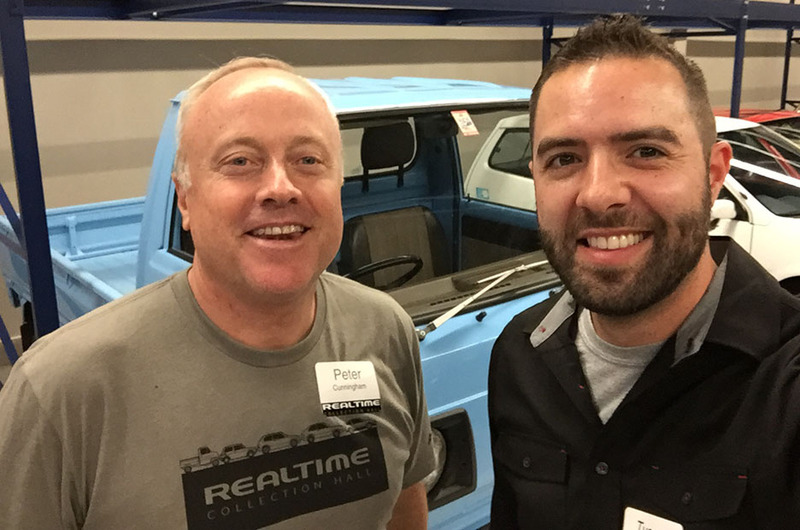 Peter’s car collection has now grown to include some of the rarest of the rare – including a vehicle or two that were never even originally sold here in the United States. He and I go back quite a ways. In fact, I threw him the key to my NSX last October at the Palm Springs NSXPO so he could take it for a spin. 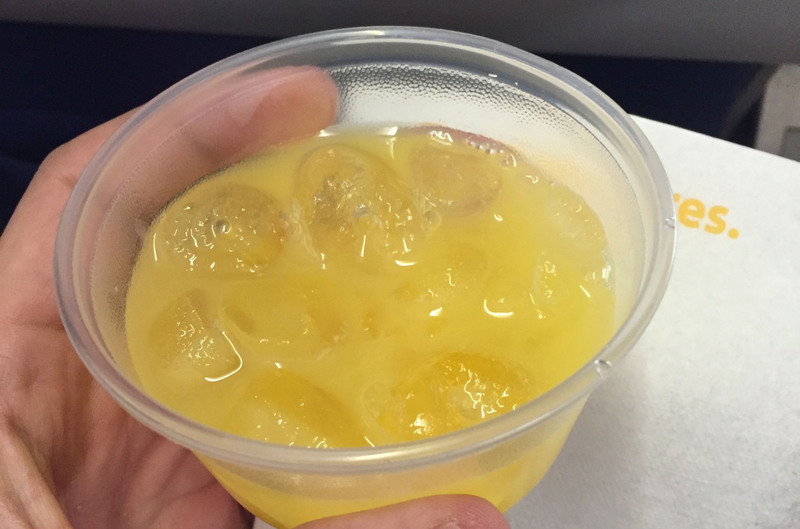 I caught a flight to Milwaukee on Wednesday morning bright and early from Phoenix. Luckily, my “early bird” Southwest check-in gave me an “A” group boarding priority so I was able to get a window seat right over the wing, just where I wanted it. In-air travel time was right around 3 hours. Right off the bat in MKE, I noticed how humid it was – but I wasn’t complaining – the temperature, at 88 degrees, was 20 cooler than back home. My yellow 2016 Kia Rio from Dollar Rental was a sight for sore eyes. At least I wasn’t at risk of losing it in a parking lot. I was, however, in dire need of re-learning to drive an automatic transmission. I exited the rental car lot and realized I still had my inspection waiver I needed to give back to the attendant. So I had to loop around and re-enter the garage. I found a place to quickly park the car with the hazard flashers on so I could run over and turn in the paperwork. It wasn’t until a few minutes later when I returned to the car that I realized: I had left it idling in “DRIVE” with the emergency brake activated the whole time. As in, I hadn’t even put the car in park. Doofus move. But that’s how I’m used to driving my stick shifts! Coast into a space, pull up on the brake, and voila. Thankfully the Rio didn’t go anywhere while I’d stepped away. The location of Peter’s museum was about 20 minutes north via Interstate 43. 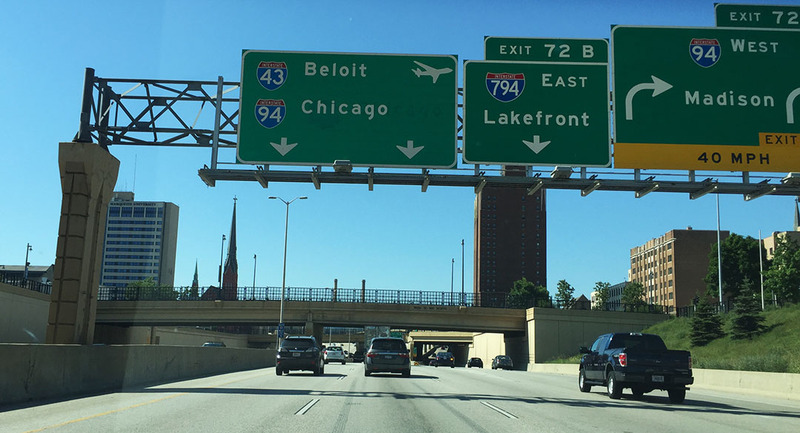 It’s a convenient area with easy freeway access. I wasn’t sure until arriving exactly who had been invited nor what to expect during the program. Peter’s Collection Hall – dubbed “RealTime” Collection Hall – is named after the race team with which he’s competitively driven since the 1980s. Among the vehicles on display is a souped-up Acura TSX which itself is a seasoned RealTime race veteran. The location of the Hall is not far from RealTime Racing’s headquarters in Saukville. Aside from a small sticker on the glass front door, it’s not well marked, and that’s by design. This is intended, after all, to be an exclusive, invite-only, private facility for special occasions like this first one. The interior space is divided into a few distinct areas: Immediately upon entering the building, the showroom greets the visitor with a highly-polished concrete floor and special signage. 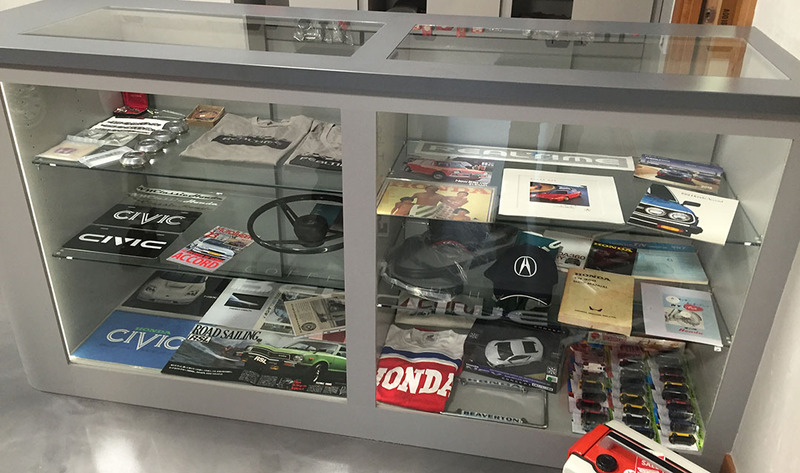 A glass counter showcases rare brochures and other artifacts from Honda history. 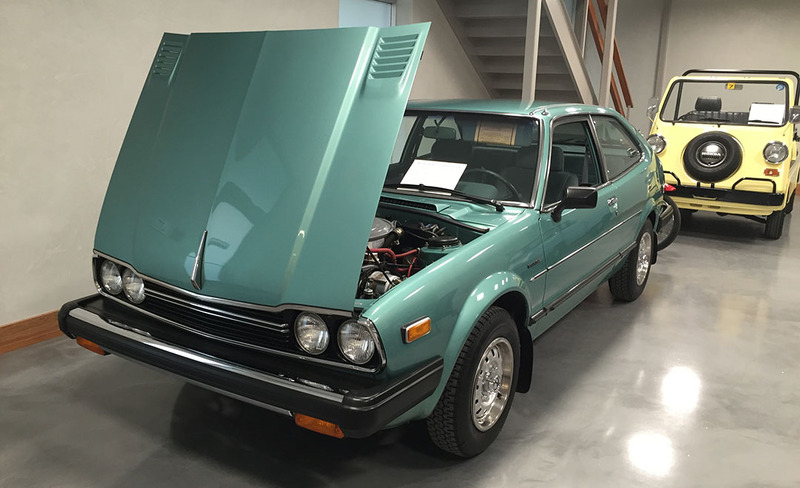 And included in this area is Peter’s pride and joy – a 1981 Accord 3-door with 4,657 original miles on it. The car at 35 years old is so well-preserved it seems like it may have been teleported through time. 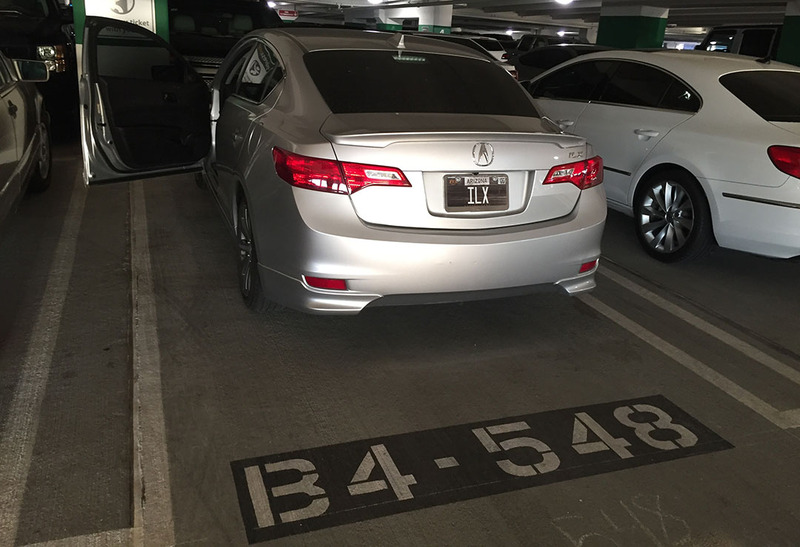 Continuing on into the first of two warehouse areas, the walls are lined with special Honda and Acura automobiles that are backed into their assigned parking spaces. 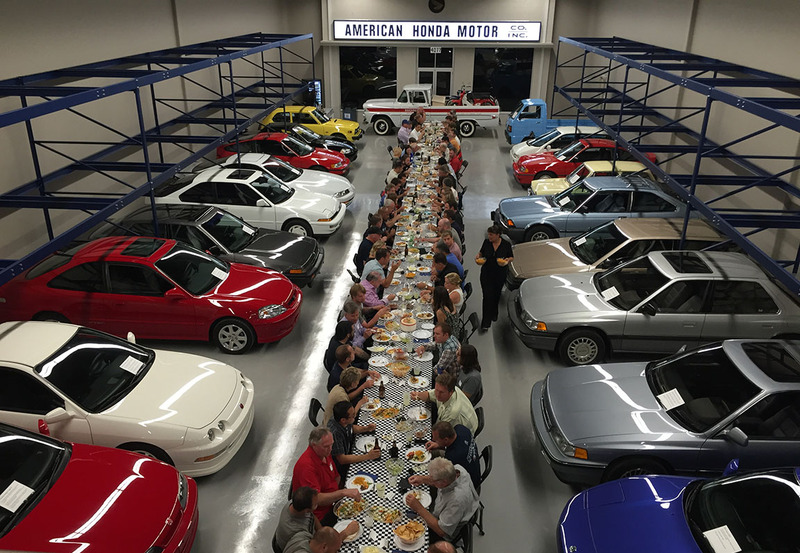 For this grand opening, the center aisle was filled lengthwise with end-to-end banquet tables that had dinner seating capacity for I would guess at least 100 people. 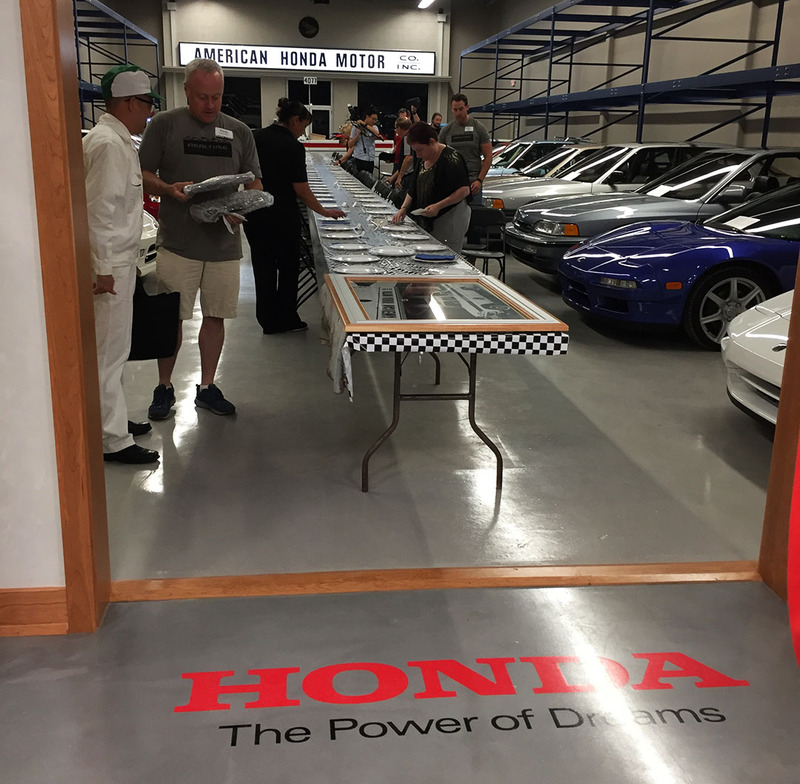 At the far end of this room is a painstakingly-constructed reproduction façade of Honda’s original North American headquarters which was located in Los Angeles in the 1960s. The signage, aspect ratio, and even drainage system (though indoors) has been designed in exact detail to mirror that of the original building. The “real” location (4077 Pico Boulevard), incidentally, is currently up for lease and most recently housed an acupuncture studio. There were too many cool cars on display to even begin to comment about each, so I’ll post a 5-minute video below and let my readers take a stroll through the Hall at their own leisure. The opening night program consisted of a few remarks by Peter from the balcony while everyone was seated for dinner (catered by Poco Loco Cantina). Peter acknowledged the many people who had traveled great distances to attend. One guest, Guido, had flown in all the way from Germany. Among those who’d been invited were a few great friends of mine, including Jhae from Phoenix, Ben who I’ve known for years from the NSX community, and Scott & Sandy who are friends from Palm Springs who I visit regularly. Ben and I posed for a photo next to the 1987 and 1990 Legends on display. On Thursday I woke up to sunny weather in Glendale and spent the morning getting my bearings with the neighborhood. I’d arranged to meet my friend Brad near the WI/IL state line but we hadn’t yet defined a meeting point. 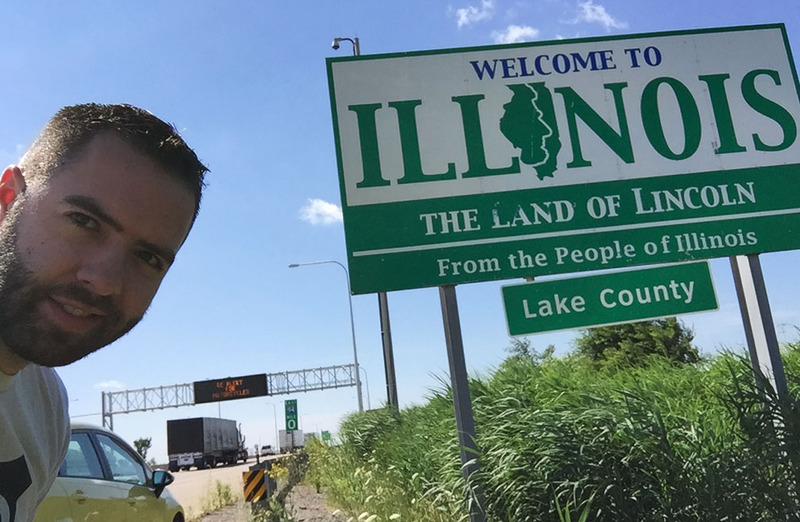 My drive down I-43 and I-94 was a breeze – within about an hour I’d already pulled over for a customary photo at the Illinois state line. Our meeting point ended up being Kenosha, a beach town on Lake Michigan. It was great to catch up with Brad and also take a gander at his 2004 Honda Accord coupe 5-speed which he’s had since new. I offered to trade him my yellow Kia for it but he didn’t entertain the idea. Back at the Milwaukee airport, I made myself at home at Gate C21 by spending about an hour wiping out 250 missed emails from my work inbox. Reality set in about 3.5 hours later when I came out of the Phoenix Sky Harbor terminal and walked into the blow dryer that is our summer evening weather. Gotta love it! Thanks for coming along! The Power of Dreams, indeed! My favorite car in the collection: Peter’s “Monaco Blue” Acura NSX. It’s one of only 3 in this combination (black interior, 6-speed manual transmission) for the model year. Hey, that looks familiar! Peter has a GS-R similar to mine and with almost the same odometer reading (241,000). 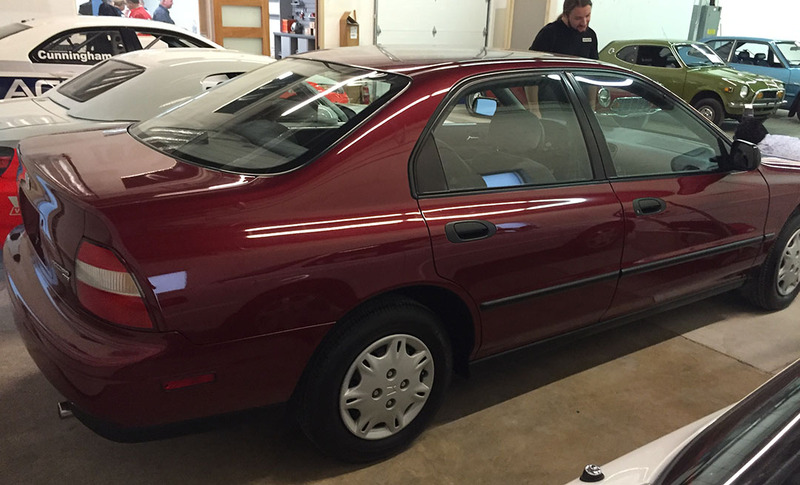 This 1995 Accord was something special. “DX” base model: Manual windows, manual mirrors, manual locks, no radio, no air conditioning, and a 5-speed manual transmission. Bare bones, but with fewer than 10,000 miles! 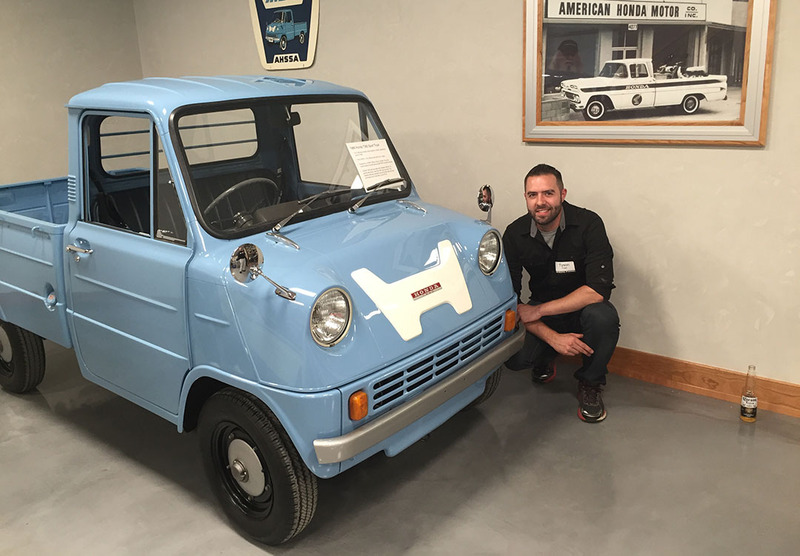 This is a 1966 Honda T360: Honda’s first production automobile! Column shift manual transmission. That would be fun to drive! Here’s the man with the vision! Peter himself. 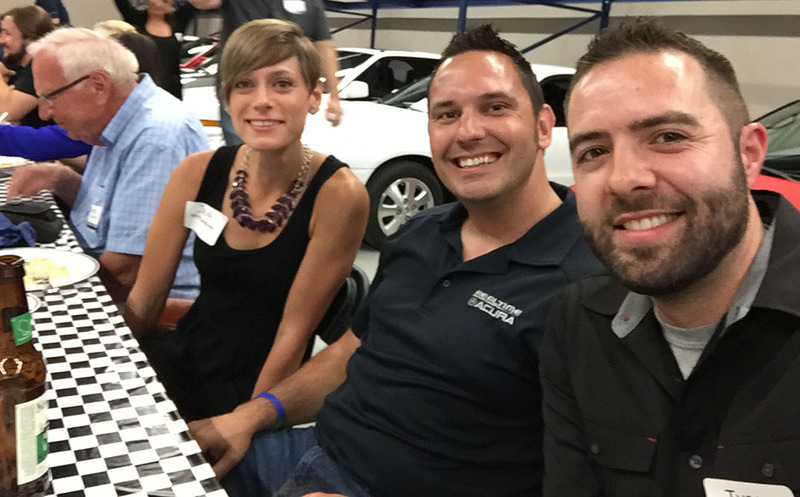 RealTime race driver Ryan Eversley and his girlfriend Jen were seated next to me. What is this stuff around the wheel well of this Ford Taurus? Rust is abundant in WI and something I rarely see in my area. Some nice homes in the Glendale area. Lake Michigan in the background, as seen from Kenosha. It’s pretty out there, and weather couldn’t have been better. Brad’s 2004 Accord was looking good in the parking lot at lunch. This entry was posted on July 15, 2016 at 10:46 am and is filed under Car Show. You can follow any responses to this entry through the RSS 2.0 feed. You can leave a response, or trackback from your own site. I KNOW! Only like 17,000 miles on it, too! I knew you’d love that one. Wish you coulda been there. HAPPY FRIDAY! I didn’t realize that until you just said it! ACUPUNCTURA minus a few letters does = ACURA. I have been researching that building today. Looks like it sold recently for a little over $2 million. Neighborhood (at least according to Street View) doesn’t look very nice but you know if I won the lotto, I would DEFINITELY buy that property and restore it to 1960’s Honda spec. Admit it, you had a hard time giving the keys to that BRIGHT yellow Rio back to Dollar. I’m disappointed there’s no pic of the boneless wings we had for lunch! Haha. 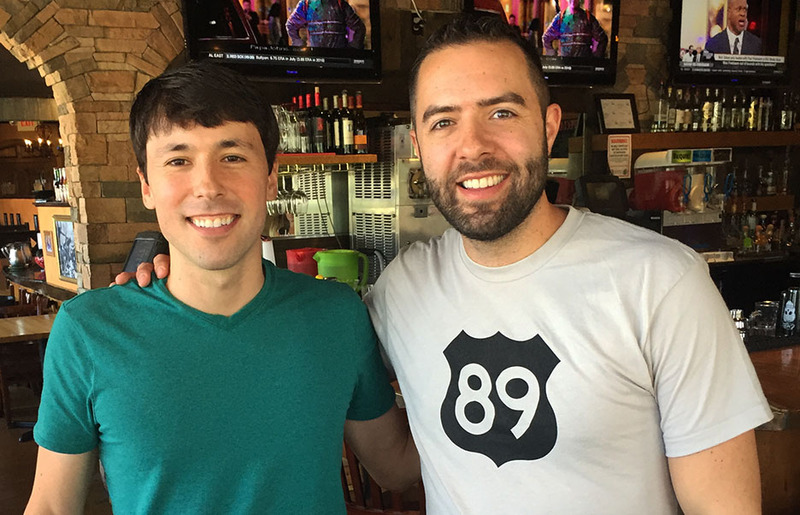 Glad you had the time to drive south for a quick meet up. Hopefully it won’t be another two years! Isn’t that amazing? I had a similar experience with a neglected Honda a few years ago. 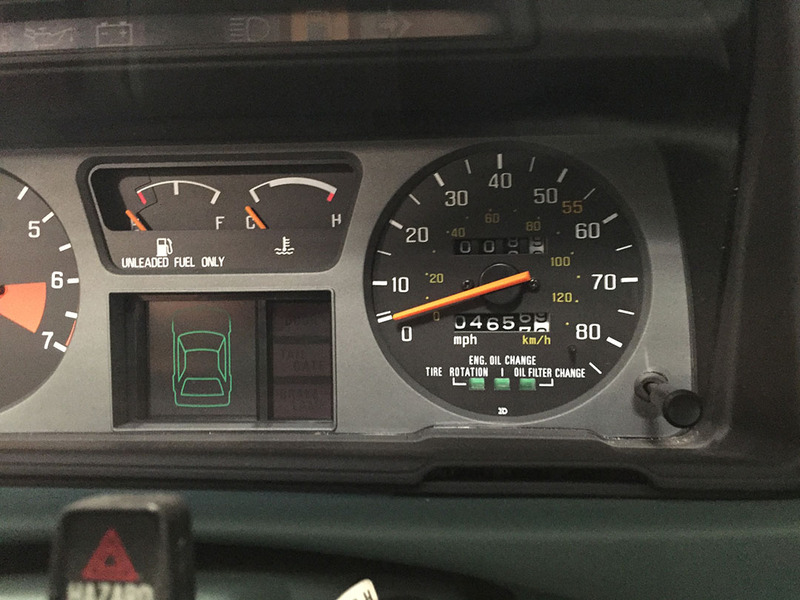 I picked up a 1988 Legend coupe that had been abandoned in the desert for many years – so long, in fact, that the entire fuel system was gunked up with bad gas. A new fuel tank and some maintenance items later, and the motor fired to life again. I later sold that car on Ebay to a collector in Florida and it’s still cruising along happily there. It was a great opportunity to be a part of this week’s event. Someday maybe I will host a similar one of my own! Hahaha 😉 Have a great weekend, Pam! Ohhhhh! I spy an 88 teggy SE. That was my favorite Acura I’ve had so far. Those rarer than a minty black on black 6 spd GS. I’ve only seen 3 since I sold mine in 1999. Mine had 5 spoke BBS wheels. That is quite a collection. I remember when the teal Accord came out. Matter of fact, one of my uncles paid dearly for one. I recall he was on a “waiting list” for it, and then finally got a call one day to go pick it up. He did not have much of a choice and ended up with a tan Accord but it was the same version as the teal one with the low mileage. The blue NSX – what else can you say? That car is gorgeous. Finally, thanks for the quick shot of the “S” versions – an an S2000 owner, those are special. Hey Joe, you bet! Glad you enjoyed. I wonder what ever became of your uncle’s Accord. Makes you wonder — if you got a brand new car today to put away for 35 years and pull out in 2051, what make/model would it be? As a comment posted earlier..no one more deserving than you Tyson to be at the event. Enjoy brutha!!!!! Thanks Brandon! It was a real honor to be invited to this. Can’t wait to see how the collection evolves in the coming years. 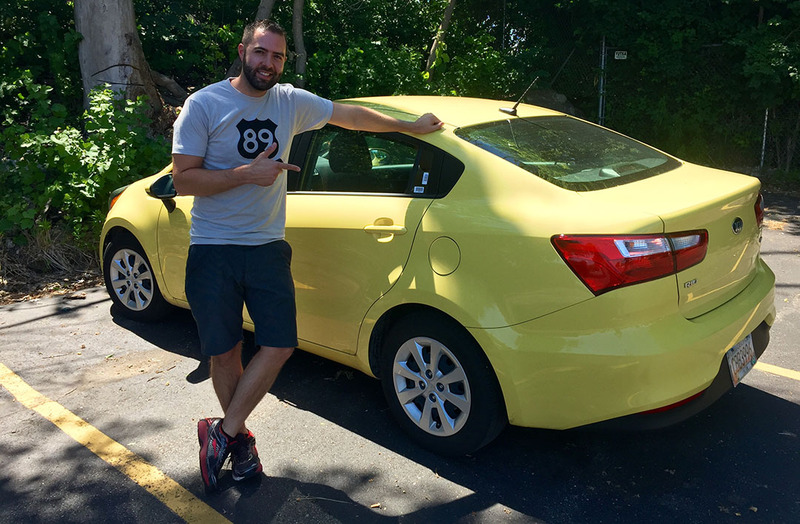 Oh gosh… We had a 16 Rio as a Rental car in Puerto Rico a few months back…. I don’t understand why that car is so dang popular over there. Wasn’t that great of a car, haha. Had no idea that Realtime Collection Hall even existed! Wish it was open to the public, since It’s only a 1.5 hr drive to Milwaukee from my area. I didn’t realize you were that close! One of these days we will have to meet. 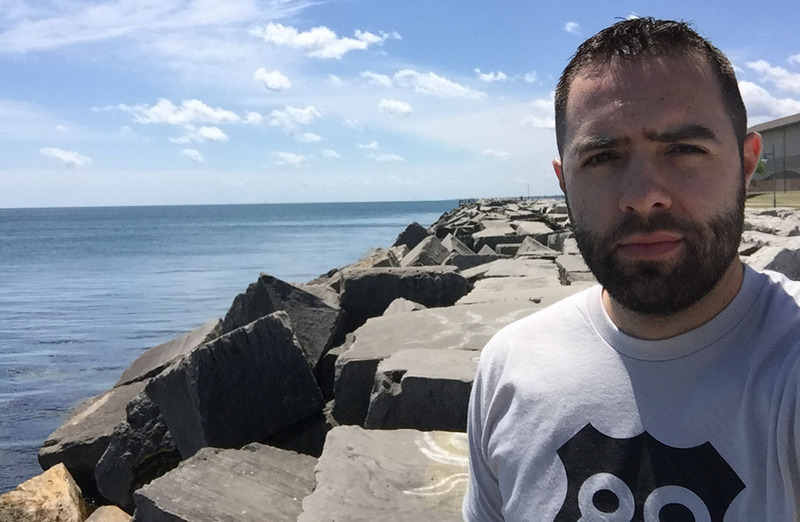 I really loved the weather on the shore of Lake Michigan. So utterly awesome! Thanks for the (virtual) tour. Seeing that ’81 Accord brought back a lot of memories- my parents’ first Honda was an ’80 Accord hatchback (auto). My Mom still swears it’s the best car she ever owned. Was it my imagination or was there a second first-gen Accord in the back room? I swooned over that ’00 Integra Type R in Phoenix Yellow. My favorite car of all time, and someday I’ll own one. Life goals! I know! Don’t tempt me! I don’t own anything older than a 1992 and someday I want to. What year is the NSX Tyson? Really? Do not understimate the power of those older cars. 😉 They were sweet! I have had in the past both this first generation Honda Accord coupe ( I believe mine was a 1980 Accord hatchback) and a first generation Honda Prelude. I loved the Prelude. It was stick shift. It was awesome. If it had not been crashed by a lady who took a stop sign and hit me on the side, I would probably still own that car! It looked just like in the link below. It was silver with a red cloth interior. 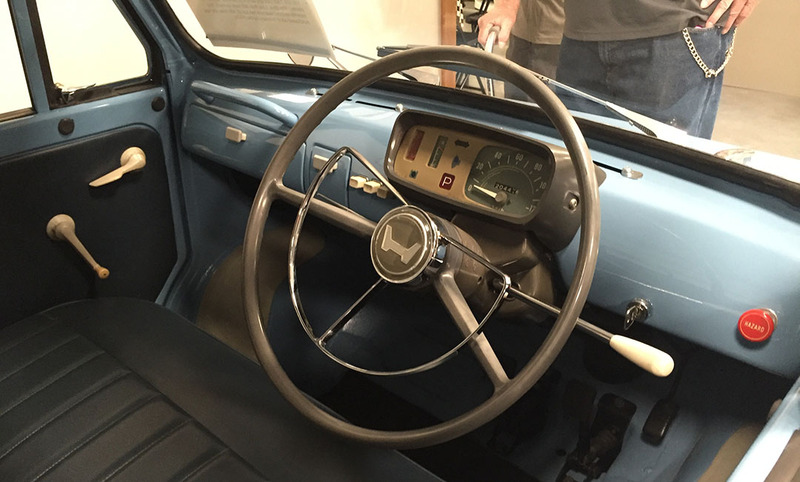 It had a 5 speed manual transmission that felt like butter. Such smooth soft clutch and gear shifting. And a great thing about it was that even though the car was small outside, once you got in, it felt very roomy inside. Had a backseat. And a sunroof. Man, I miss that car! Stop it, you’re making me want an early Prelude again! 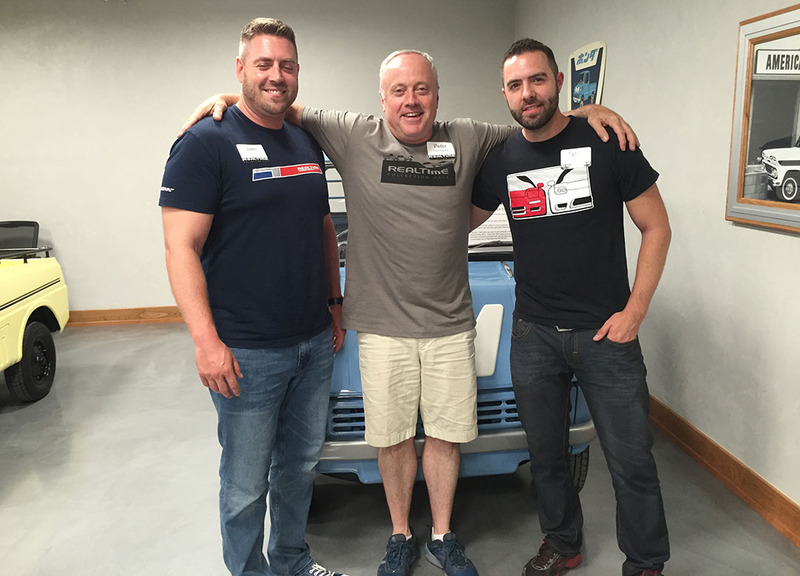 Looks like it was a fantastic event with some like-minded individuals. Love the grey Prelude at 1.24 in your video. My Uncle had one for many years when I was growing up. It was a great car, but unfortunately he had to ditch it due to some serious rust! Yeah being in the Midwest made me appreciate all the rust free older cars we have in the Arizona area! 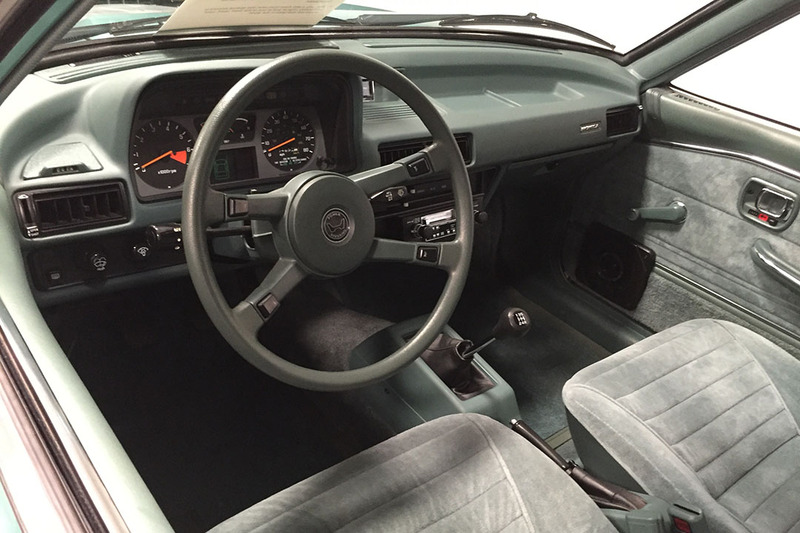 One day I would love to have a first gen 79-82 Prelude. WOW! Thanks for the video tour and all the pictures. What an absolutely amazing museum he’s built! And now I know what happened to that brand new Hampstead Green Accord I was drooling over a few months ago when it was up for auction! I hope to visit someday and meet Peter! I should have known you’d have some history on that ’81 Accord. It was shipped to Wisconsin from California. Original down to the stickers and keys and everything! One day you will definitely need to see this collection. He needs a couple more Preludes 🙂 Hope you’re having a great weekend! I had a fantastic weekend, thanks! Yes, seeing that Accord and everything else in this collection is definitely on my bucket list! As far as that car, it was on Ebay a few months back and we were shocked at the price it went for. I heard from a friend that he knew who it went to, but couldn’t say who. Now it all makes sense! Glad you enjoyed! Within the next day or two, I’ll be sharing a small gallery of all the RealTime Acuras in the collection on AcuraConnected.com. Stay tuned there! 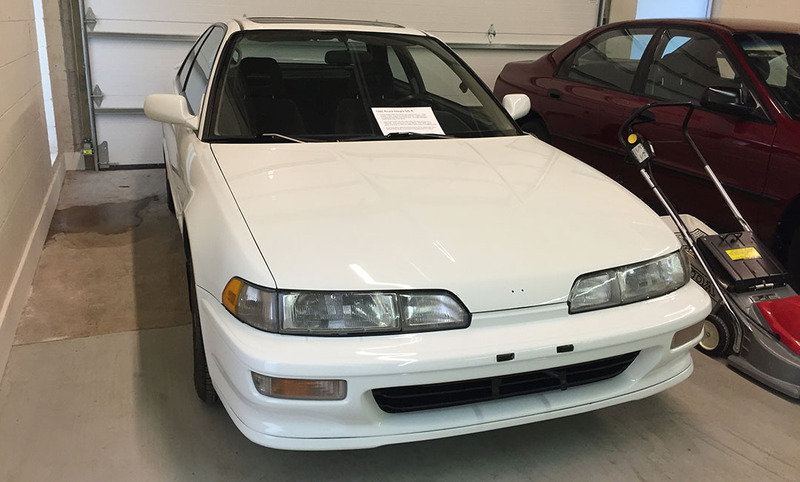 Not sure why, but I really want to take a mid 90s Accord DX for a spin now…something about that simplicity! I couldn’t get over the simplicity! 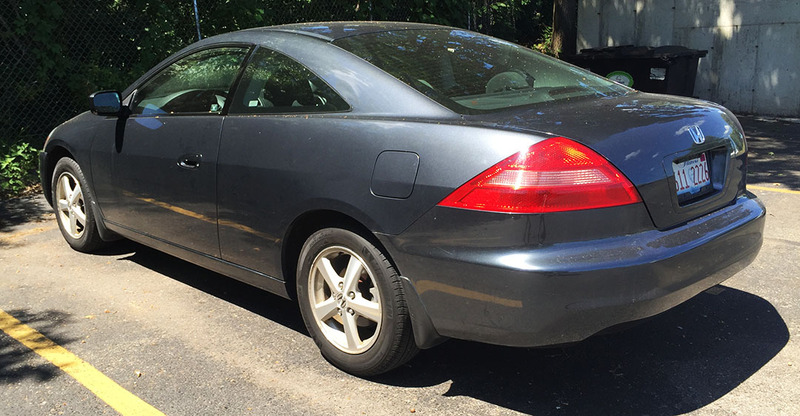 Talk about a bare-bones Honda. The lack of A/C in Peter’s example would be a death sentence out here in the desert, but everything else about it I loved. Especially those manual roll-up windows. 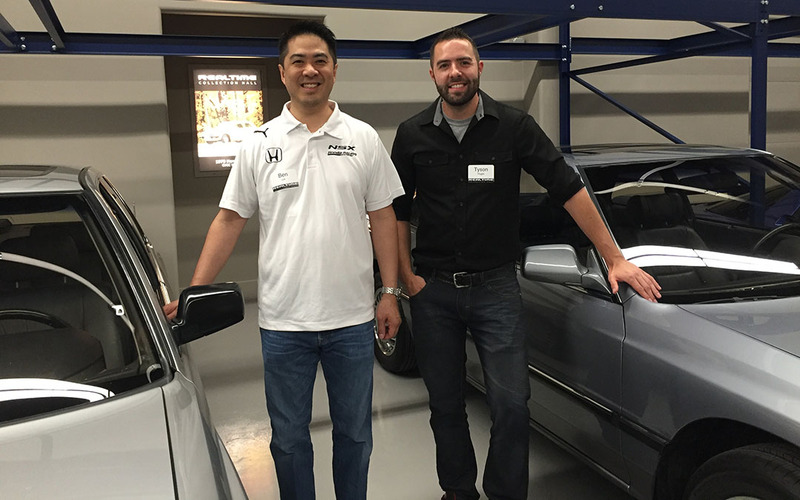 NSX-1G LC-1G LS-3G Accord… you had me at hello! I figured you’d appreciate a few of these well-preserved gems! Thanks Mark!